July 15 marks a symbolic victory for the Turkish people. It was the first time in Turkey’s 94-year history that a military coup failed. One year on, TRT World brings heroic stories from the night. Events are being held across Turkey today to commemorate the second anniversary of the failed military coup. At least 250 people were killed during the attempt, which Turkey says was orchestrated by Fetullah Gulen and his followers. Melinda Nucifora reports from Ankara. July 15 marks one year since the failed 2016 coup in Turkey. In our special coverage, we look back at the events of that night, its aftermath and consequences for the country. Turkish citizens are commemorating the day with marches. 15th of July marks anniversary of the failed coup in Turkey. Prof. Dr. Nilufer Narli, one of the keynote speakers of the International Family and Violence Conference has more to tell. Yusuf Alabarda speaks on the anniversary of 15th July coup attempt. He is a defense and security analyst. He graduated from Naval Post Graduate School. He has MBA on International Defense Resources Planning and Management. Yusuf Ozhan is a journalist and Head of Digital at Esmedya. He talks about FETO terror organization on the first anniversary of 15th July coup attempt in Turkey. Nagihan Haliloğlu is an assistant professor at the department of civilization studies at Ibn Haldun University. She talks to TRT World on the anniversary of the failed coup attempt in Turkey. TRT World correspondent Ediz Tiyansan's interview with Paolo von Schirach, President of Global Policy Institute. A year on from the day that shook Turkey, we join millions on the streets of Istanbul to remember those who lost their lives during the July 15 failed coup. One of biggest impacts of the attempted coup in Turkey has been the thousands of government employees who were fired, suspected of having links to the Fetullah Terror Organisation. Turkey says it's to protect national security. But critics say thousands of innocent people are being caught up in the crackdown. Nicole Johnston reports from Istanbul. In Istanbul, hundreds of thousands gathered on the iconic July 15th Martyrs Bridge to mark the one year anniversary. TRT World's Sara Firth shows us the emotional scenes as people remembered those two hundred and forty nine people who lost their lives that day for their country. Uzeyir Ok from Ibn Haldun University talks to TRT World on the events of the July 15 coup attempt in Turkey. 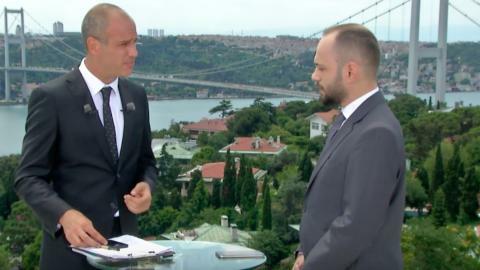 Political advisor Onur Erim talks to TRT World on the events of the July 15 coup attempt in Turkey. Tarik Lusija from Sarajevo, Bosnia thinks the Turkish people taught a valuable lesson to the Western world on the night of Turkey’s failed coup after seeing how Turks from different ways of life fought off the coup plotters. Hakki Ocal, Milliyet newspaper political editor, talks to TRT World on the events of the July 15 coup attempt in Turkey. Hundreds of thousands of Turks are marching in Istanbul to mark the anniversary of last year's failed coup.